The Barnyard Theatre presents: One Vision – A Tribute to ABBA & Queen –both known for their musical style; combining pop and rock riffs, massed vocal harmonies, overdubbed guitar work, catchy pop melodies, surreal humour, and flamboyant, theatrical performances. 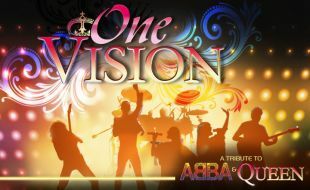 One Vision features an 8-piece cast who replicate ABBA and Queen in every sense; from the music, harmonies and costumes to the choreography, personalities and mannerisms – bringing the songs we all love back to life again. One Vision is about showmanship, charisma, harmony and the power of the music created by these two super groups – that all come together in one mind-blowing concert!